Genesis G70 has been awarded the 2019 North America Award of the Year at the Detroit Auto Show in Michigan on Jan. 14. 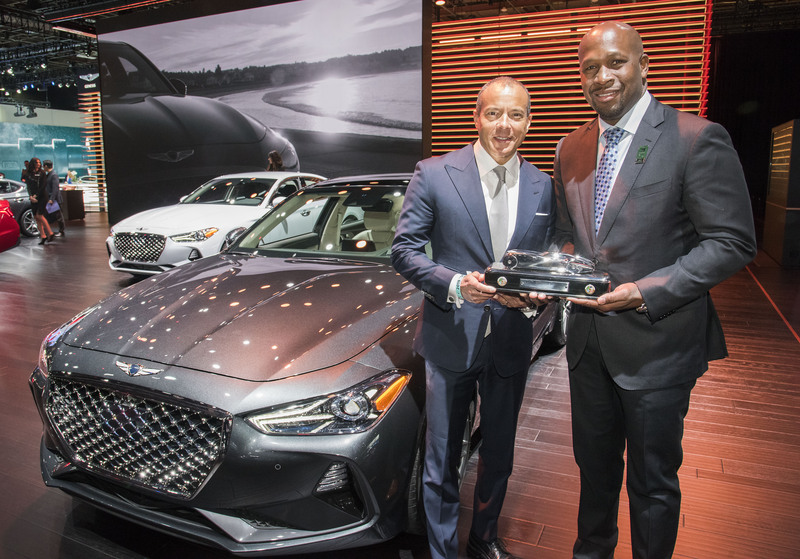 Manfred Fitzgerald, executive vice president and global brand chief of Genesis Motors, and Erwin Raphael, executive director at Genesis Motor America, hold the award. Hyundai Motor Group plans to tide over. A crisis by expanding sports utility lines this year. In a meeting of overseas operation chiefs at the group’s headquarters in Yangjae-dong, southeastern Seoul, on Dec. 14 in which Hyundai Motor Group Executive Vice Chairman Chung Ui-sun presided over, the group established 2019 strategies to overcome a difficult business environment by expanding SUV lineups. Executive Vice Chairman Chung also presided over a ceremony to launch the 2019 business year for the first time unlike previous years in which Hyundai Motor Group Chairman Chung Mong-koo chaired such an event. In his speech at the event, the junior Chung said, “New rules that differ from the conventional ones are shaping up, and management environment uncertainties are getting greater continuously.” He emphasized the pursuit of a new growth, departing from the conventional growth method. Executive Vice Chairman Chung also called for the creating of a corporate culture in which failures can be forgiven and they can be made into growth engines by learning lessons. The group does not see the outlook of the global automobile market as rosy. The Hyundai Motor Group Global Management Research Institute predicted that global automobile demand will equal 92.49 million units, a meager 0.1 percent rise over last year’s estimate of 92.44 million units. The demand of the U.S. market will be forecast to decline to about 17 million units, down 1.4 percent from last year’s. That of the European market is also expected to drop 0.2 percent to 17.8 million units. Demand within the Chinese market is predicted to increase 0.2 percent, influenced by the base effect of a 4.1 percent drop in demand for the year 2018, but that will translate into a decline of 23.2 million units. In Korea, automobile demand is likely to drop 1.0 percent in the wake of the sagging domestic demand and shrinking consumer sentiment despite the prolonging of a drop in individual consumer tax. Hyundai Motor and Kia Motors have set “securing profitability” as the 2019 business buzzwords. Executive Vice Chairman Chung stressed profitability during the meeting with overseas operation chiefs. His words may be construed as his emphasis on shoring up a profitability base through substantial production and sales, rather than setting unrealistic sales targets. He suggested guidelines such as restoring sales targets and profitability, organizational innovation and agility enhancement, and strengthened execution of future businesses. Chung emphasized that 2019 should be the first year of restoring sales following a V-curve format, with a focus on markets such as the United States and China. He also stressed organizational efficiency designed to cope with market changes and ramp up execution of strategies, as well as a continued overhaul of a decision-making regime. Each sphere headquarters will have to take the lead in making the group reborn into a company offering customers new experiences and premium value through strengthened collaboration. He urged each sphere headquarters head to become an “accelerator” to provide support to staffers who demonstrate a challenging spirit on a voluntary basis. He said all changes and innovation lie in “back to the basics” and companies will only survive if they can reply to the question, “Which one can offer more satisfaction to customers, Chung said. Chung reaffirmed his goal to restore his group’s reputation in major markets such as the United States and China. He indicated that if the group fails to compete in the United States and China, it will be forced out of the global market. Hyundai Motor and Kia Motors have a strategy to strengthen sports utility vehicle lines on the U.S. market. The automakers are trying to take up the gauntlet in the U.S. SUV market by releasing Hyundai Motor’s new SUV, Palisade, and Kia Motors’ new SUV, Telluride, there early next year. In cooperation with the Chinese multinational tech company Baidu, Hyundai Motor Group plans to position new cars outfitted with advanced technologies at the forefront to ramp up its presence in the Chinese market. Hyundai Motor plans to come up with new cars such as ix25 and Santa Fe Sonata in China while Kia Motors will release strategic cars such as K3 and KX3.